This time the spotlight will be shining on Out Of Memory, in which you’re tasked with… well, not running out of memory (surprise!). Let’s help it escape the cold, lonely emptiness of Greenlight limbo, eh? Rule your PC’s memory and keep it alive as long as you can. New applications will keep coming and it’s your task to assign them to memory slots. But be careful – if you run out of space you might get Out Of Memory EXCEPTION! Now, while most of you are surely rockin’ at least 32 gigs of RAM today, I have to say, don’t think the game really cares about that. Which is a good thing for those still gaming on toasters, ya know? 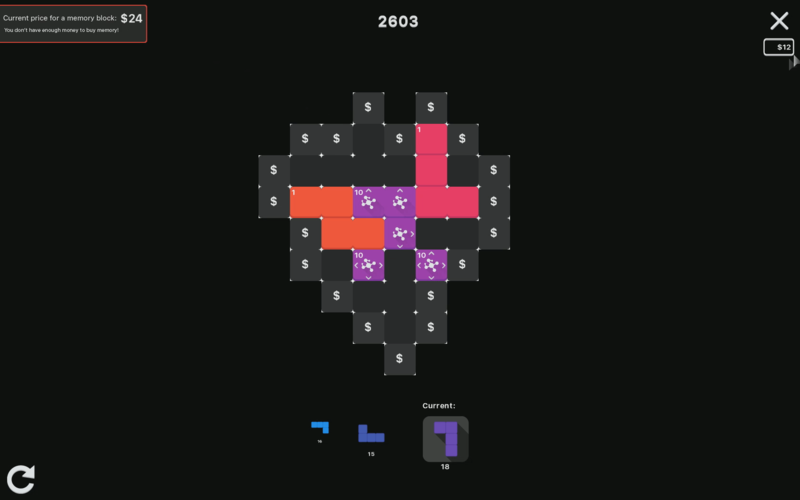 Jokes aside, Out of Memory looks like a case of ‘easy to pick up, hard to master’, what with its Tetris-esque design and all. Normally, managing memory allocation is by no means the most exciting thing ever, but the concept… as a puzzle game? That could actually work, and very well at that. That is, provided it doesn’t, you know, run out of memory. Ah, funny joke. So riddle me this, dear reader: why is Out Of Memory still struggling to get through Greenlight? It’s not out just yet, but even so… how about visiting its Greenlight page and handing over a ‘yes’ if you like what you see? Remember: your vote could be the one that grants it access to Steam!